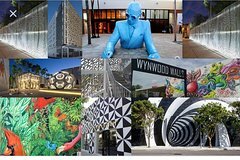 Your private VIP Tourator (historian/art/architecture curator) will guide you through the newest luxury district in the country, with amazing public art installations, the best in private art collections and home of the Institute of Contemporary Art. Viewing one jaw dropping art installation, to an award winning architectural gems, to the best of the best with all the global designers from Louis Vuitton, Hermes, Prada, Dior to name a few! Your tour will curate the arts and include a private visit to the de la Cruz collection, the museum garage and/or Institute of Contemporary Art. Your curator takes you to visit the de la Cruz Collection to the Museum Garage, to Buck Minster's dome at Royal Palm Court. a cuban coffee This is a walking tour, which is the best way to see and tastes the different flavors of the Design District, at the end of the tour we give you suggestions where to eat, and you are always welcome to upgrade with us for a great 3 course lunch at Estefans for $35.00 or St. Roch Market Food Hall for an additional $30.00 per person for a great feast of delights and artisan chefs, or just continue to explore this historic epic center of fashion, design and art! Tour does not include gratuities for curator or gratuities and taxes if restuarant upgrade options were applied.